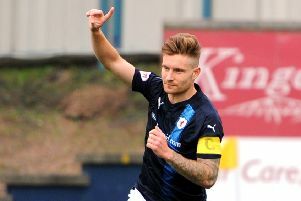 Raith Rovers captain Jason Thomson says the side are in good shape going into Saturday’s opening league match of the season. The Kirkcaldy side have progressed into the next round of both the Petrofac and League cups, keeping clean sheets into the bargain. However, Thomson, speaking after the victory over Albion Rovers on Saturday, said they will have to step up a gear when facing Livingston. “I’m happy enough with our last two games,” he said. “Last week was hard, because Cowdenbeath is a difficult place to go so to get a 1-0 win was good. “Today it was good up until maybe 30 minutes to go. We slackened off and it became one of those games. “It wasn’t good enough, and the manager said so. We should have kept going right until the end and we could have got four, five or six goals which would have done us a lot and that’s what he wants us to do. “But it was another clean sheet for the back four. “I think I played OK. My final delivery into the box wasn’t great but that’s something I’ll work on during the week. Thomson described the injury to Lewis Vaughan as “a worry” and said he would try his best to look after the youngster. “He’s been outstanding during pre-season and now that he was getting a run of games I expected to see him go on and have a good career. “I spoke to him at half time and I could see he was a bit down. His knee had popped out and gone back in. I’m no physio but that doesn’t sound too good. The skipper says the two victories will help going into Saturday’s tricky match against tougher opposition. “We could have been going into the first game of the league season having not won any games. We know that Livi is going to be a hard game and I said that to the boys as we came in at the final whistle. “It’s a tough, tough league and every point in every game we’re going to have to fight for. “We’ll have to step up our performance for next week. Livi will come here and make it hard.